Beat egg whites and salt until foamy. Gradually add sugar, beating to stiff peaks. Add vanilla. Mix nuts, cracker crumbs, baking powder and cornstarch. Fold into egg white mixture. Spread in greased 9-inch pie pan and bake in 300 degree oven for 40 minutes. Allow crust to cool. 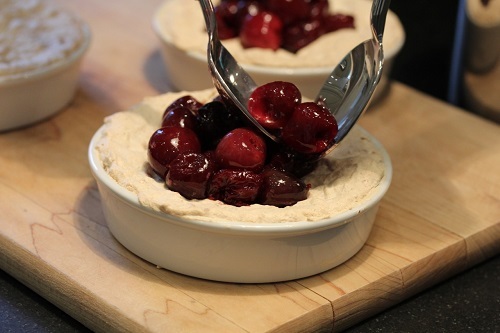 Place pitted cherries and ¾ cup of sugar in a saucepan and cook at medium-low heat until soft, but not soggy. 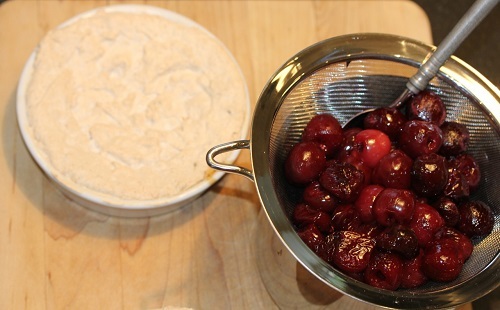 Drain liquid from cherries. 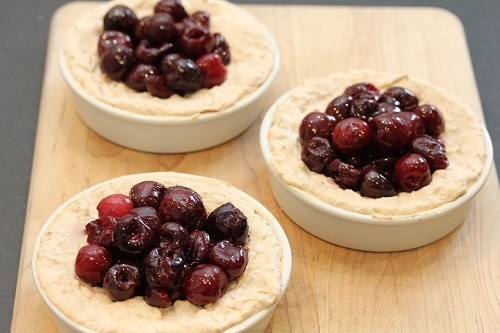 When crust is cooled, spoon cherries on to crust and serve. Note: I used small baking dishes in the photos. If you decide to make the torte in smaller containers, decrease baking time from 40 to 30 minutes. This is a big favorite of mine because the crust is unusual – very chewy and delicious because of the beaten egg whites in it.